To be the partner and trusted resource for philanthropy in our community, providing stewardship of charitable intent so the impact of generosity will last for generations. 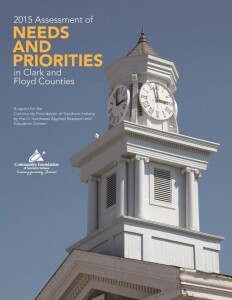 The 2015 Assessment of Needs and Priorities in Clark and Floyd Counties has highlighted our area’s greatest needs, the highest priorities for funding, as well as the gaps and overlaps in services and in funding. This report will help the Community Foundation of Southern Indiana focus our grant making from the unrestricted Community Endowment Fund to directly address the greatest needs of our region as identified by our community’s residents, businesses and community leaders, and nonprofit service providers. Priorities tend to be things that people value and think are important. Needs are those areas where the largest number of respondents indicate that the community does not perform well, and more needs to be done to address these areas. 1. Meet the basic needs of community members, particularly the homeless and the mentally ill.
2. Build a qualified work force to attract good jobs by supporting education and enrichment across the life course. 3. Sustainably develop the economy to provide meaningful work and broadly shared economic security through living wage jobs and a clean and safe environment. Get in touch with us to discuss your how together we can make Southern Indiana’s future even brighter! ©2019 Community Foundation of Southern Indiana. All Rights Reserved.